For the past decade, we’ve had modest snowfalls that were beautiful but not particularly problematic since we’ve learned how to keep the animals fed and maintain access to the outside world. For the most part, we’d just settle in for the winter beside the wood stove with a cup and a book, tend to the necessary things like keeping the animals fed and watered, and rest up from the activities that go with the fall. At least that’s how it was before we brought Herland Forest Cemetery online, and we’re in the process of making adjustments. While most everything that has to do with a farm can be predicted, and to some degree scheduled, operating a cemetery isn’t like that at all. Like birth, death comes when it comes, and when the snow gets deep, the challenge of keeping faith with the people who’ve purchased interment rights, or who have died unexpectedly and want to be interred in the forest, made this winter notably different from the winters that have gone before. Usually, we “enjoy” two winter events a season. A key element of what makes for a “event” involves overnight temps dropping down into the single digits. Often that temperature drop holds off until after the first of the year, but we’ve also seen single digits temps in the second week of November‒given the variability of weather here in the Pacific Northwest, there’s just no telling when serious cold will come. If we’re fortunate, we’ll get a covering of snow before the serious cold sets in. That matters because snow insulates the ground and prevents it from freezing. That’s important because if the surface is frozen then it can’t absorb moisture as the snow above the frozen ground starts to melt. At that point, the moisture we need to recharge the water table just runs run off down the hill to the river. The very worst case is when we get a hard freeze, followed by heavy snow which is followed immediately by a warm rain. What can happen then, is the snow soaks up the rain like a sponge until it raises the temperature of the snow pack to the point where it all turns to slush and runs off down the hill. That’s what happened in the spring of 1996; it caused the Klickitat to flood to the point where a quarter of the road between Windward and the Columbia River was washed away. This winter, we had another unusual combination. First came a 2′ snowfall that over the next week compacted to a snowmass that was a little more than 1′ deep. 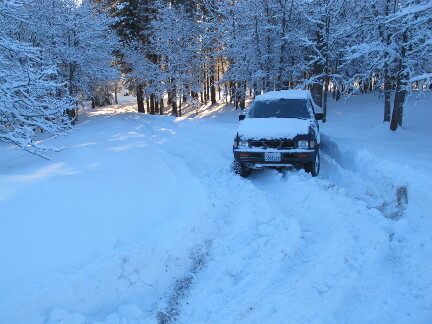 That was no problem as our tractor was able to break through that amount and create viable vehicle paths. 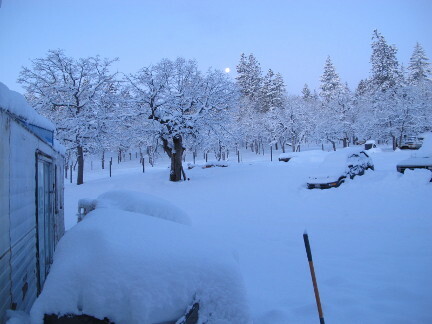 That snow was then followed a week later by another 2′ snowfall. 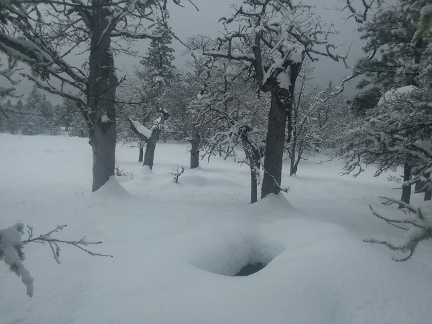 We had been able to function after the first snow fall, but the accumulation of the two snows left us with a snow cover that was over 3′ in places. So long as the snow is 2′ or less, Fergie, our 66 year old work tractor, is able to get around and break paths. But this year, the snow was too deep even for Fergie. In the past, all that would have been fine, as we would hunker down and wait out the thaw. What was different this winter was that as the winter event arrived, we found ourselves with three funerals we had to make ready for. The key problem there was that people were flying in from around the country to attend the interments, so the dates weren’t optional; we had to figure out ways to transport the remains the 3/8’s of a mile from the county road to where the graves were. 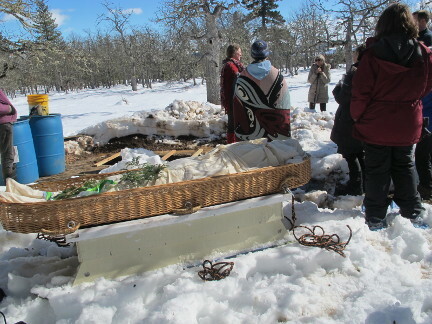 For most of the year, it’s easy enough for pall bearers to carry a body from one of Herland’s parking areas to the grave site, but when there’s a significant amount of snow on the ground, that’s not viable. So, last year we created a sleigh that is large enough to carry a person’s remains. Over a two week period, we were able to accomplish what needed to be done. Now, that the snow is melted, our thoughts are turning to how can we be better prepared for back-to-back snowfalls that exceed the depth our tractors can handle? Well, if one can’t power one’s way through the snow, the next option to try would be to go over the snow. Now that winter is passing into memory, and people are looking forward to spring, this is the time of year to purchase used snow gear. 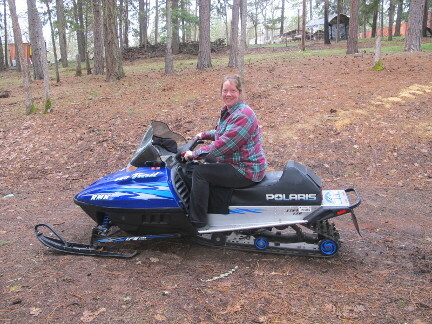 So, by keeping an eye on Craigslist and were able to acquire a snowmobile that we’ll be able to use to pull the sleigh over the snow to the grave site. Overall, this is a good example of how Windward uses what it has to cope with what nature sends our way, and then uses what we learn to regroup and develop additional options. Living close to nature, there’s always a new wrinkle to deal with, but that’s part of what keeps this way of life interesting.